Get a step up right where you need it. Folding steps can be installed almost anywhere to give you that extra lift needed to secure a sail cover, climb up the transom of a sportfishing boat or anyplace additional height makes a task safer or easier. 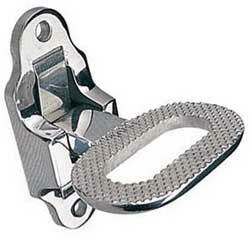 And, when not in use, they flip out of the way to prevent snagging on lines and gear. Sea-Dog folding steps are investment cast 316 stainless steel for excellent strength and superior corrosion resistance and feature a substantial non-skid pattern to hold your foot in place. A spring loaded detent holds the step open or closed and prevents it from rattling when not in use. Don’t struggle to zip the last bit of sail cover, give yourself a lift, by installing a Sea Dog stainless steel folding step.